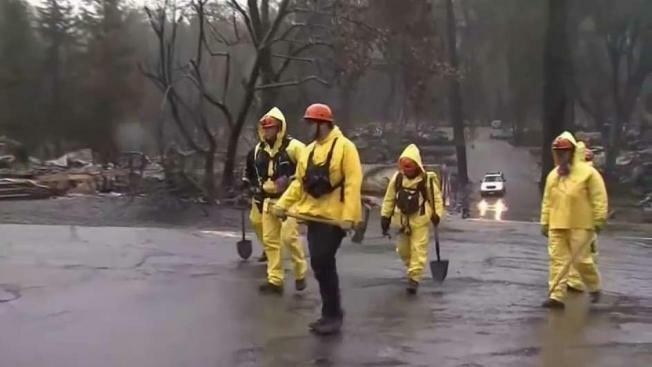 Officials in California say rain has helped nearly extinguish the nation's deadliest wildfire in the past century as search for survivors continue. As California's catastrophic wildfires recede and people rebuild after two hurricanes, a massive new federal report warns that these types of disasters are worsening in the United States because of global warming. The White House report quietly issued Friday also frequently contradicts President Donald Trump. The National Climate Assessment was written long before the deadly fires in California this month and before Hurricanes Florence and Michael raked the East Coast and Florida. It says warming-charged extremes "have already become more frequent, intense, widespread or of long duration." The report notes the last few years have smashed U.S. records for damaging weather, costing nearly $400 billion since 2015.